Kyle Busch held off Brad Keselowski and the No. 2 car’s furious last lap challenge to claim the Cheez-It™ 355 on Sunday afternoon at Watkins Glen International. It was redemption of sorts for Busch, who led the most laps during the previous two NASCAR Sprint Cup Series races at The Glen, but could not secure the top spot to claim the checkered flag in either contest. In addition to maintaining his lead over Keselowski and third-place finisher Martin Truex Jr., Busch overcame grass on his grill early in the race and three late restarts to earn the trip to Gatorade Victory Lane. Busch’s first win at The Glen came in 2008. It’s the Toyota Camry driver’s third win in NASCAR’s top series this season. Meanwhile, Keselowski’s second place showing marks his third-straight runner-up finish at WGI. Polesitter and two time (2011; 2012) race winner Marcos Ambrose led a race-high 51 laps before a crash with six laps remaining ended his day, dashing his chances for a third-consecutive victory celebration at The Glen. Sunday’s win is Busch’s second NASCAR Sprint Cup Series win at Watkins Glen International and 27th career win in the series. It marks his eighth top-10 finish at Watkins Glen International. The win gives the driver of the No. 18 M&M’s Toyota the fifth place spot in the NASCAR Sprint Cup Series driver standings, an improvement of one place. Busch’s win comes after a seventh place finish last year and a third-place showing at North America’s premier road course in 2011. The Cheez-It™ 355 at The Glen saw nine caution flags. 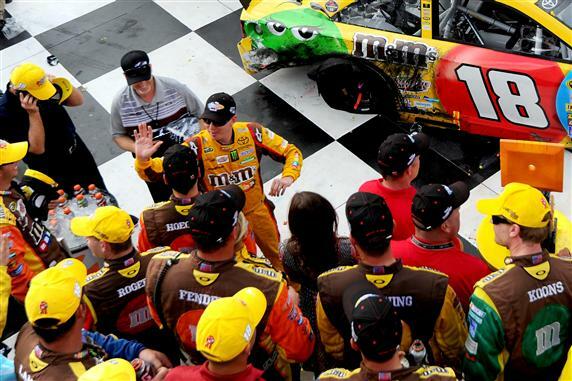 Just four races remain until the field is set for the 10-race Chase For The NASCAR Sprint Cup. Jimmie Johnson, who finished eighth Sunday, now holds a 75-point advantage over second place Clint Bowyer in the NASCAR Sprint Cup Series standings. Johnson’s finish today clinches at least a Wild Card spot in the Chase for the five-time series champion.